New Year’s Day 2016. Today. This will be Day Zero for the Frankencaster. All the parts are here and it is time to start assembling, tuning, tweaking. Looking at this photo, it doesn’t look too complicated. The complications lie in the adjustments and settings. The main complication, the neck, arrived very recently from Warmoth. It looks great! It is hard to see the compound radius fretboard though. Here’s a head on shot. It should be a 10-16 inch radius. You might be wondering why on earth the truss rod adjustment is on this end of the neck – after all, it won’t be accessible once the neck is on the guitar! But this neck has an interesting feature – it comes with a Gotoh side adjuster. This is a standard Warmoth feature in all modern Stratocaster necks they sell. The idea, I guess, is that the coarse neck bow adjustment is done before putting the neck on. The neck is installed, strung, and tuned to pitch, measured, and then the fine adjustment is done from the side of the neck. It occurs to me that I ought to explain the truss rod. Basically, electric guitars have a rod mechanism inside the neck which, through tightening or loosening a nut or bolt, allows one to bend the neck forward or backward. Necks are wood and the steel strings exert a significant force on the necks, pulling them forward. Different string gauges can provide 80 – 100+ lbs of force. 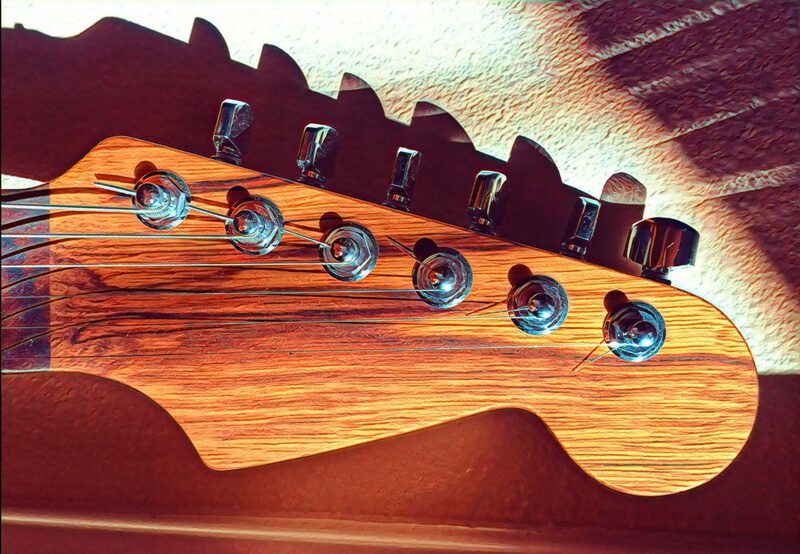 The string’s tension naturally tends to bend the neck giving it a a slight concave curvature. The stiffness of the neck and the truss rod counteracts that force. An adjustable truss rod allows controlling just the right amount of relief. Too much and the action will be too high making the guitar a pain to play. Too little and the strings will not have enough freedom to vibrate freely which will result in string buzz. The point of the truss rod is to enable adjustability and to allow precise tuning of the amount of “relief” or bowing of the neck.